Learn the research and theories behind evidence based coaching and earn your Positive Psychology Certificate. Take Introduction to Positive Psychology for Coaches, approved for eight ICF CCE's (5 Core Competency hours, plus 3 Resource hours)! What is it? It’s an 8-hour distance-learning coach training course in which any professional coach can learn evidence-based coaching techniques for effective life coaching and upgrade your results. Certified Positive Psychology Coach program. Are you ready to move your life coaching (or business or executive coaching) from woo-woo to proven? Well, plenty of non-woo-woo experts from organizations such as Harvard University and the United States Army are embracing the value of Positive Psychology and life coaching is seen as a perfect delivery model for it. 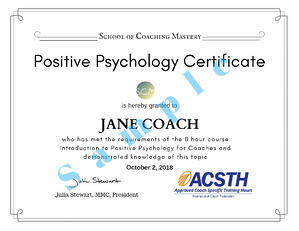 Introduction to Positive Psychology for Coaches will help you leverage the research, theories, assessments and applications of Positive Psychology and use them within your own coaching. Your live, interactive tele-webinar classes, which you can take from anywhere in the world, will introduce you to the research, theories, assessments and tools used by Positive Psychology Coaches to help their clients thrive. Who is Introduction to Positive Pyshology for? Finally, if you're a great coach, you're probably curious about Positive Psychology and what it can do for your clients. This is your perfect opportunity to find out. You're busy and money might be tight. So how can you afford to take this course? Simple. You can't afford not to find the time and money, because it will create even more time and money for you. How is Introduction to Positive Psychology for Coaches delivered? * Tele-webinars allow us to do everything in a virtual class that we can do with a live classroom, except shake hands or get stuck in traffic. Now you can learn in your own style in this money-saving, time-saving, hassle-saving format. You do NOT have to incur long-distance charges or call an international telephone number! And you do not have to go online to participate. Distance learning has never been easier nor more economical. Normally, there is an extra $100 charge to get your Positive Psychology Certificate, but we're currently waving that fee, so you save $100, if you register for the upcoming course! Need to split your tuition into 2 payments? Email info @ schoolofcoachingmastery [.] com to make arrangements at least 2 weeks before the course starts. How can you earn a Positive Psychology Certificate? And you will be awarded your Positive Psychology Certificate! When is Introduction to Positive Psychology for Coaches offered next? You’ll be able to qualify for your prestigious Positive Psychology Certificate within weeks! At School of Coaching Mastery, we help you do great work, so you can have the life and business you really want. All our programs come with our Value Back Guarantee. That means if we don't give you the value you expect, tell us as soon as possible and we'll make it right, period. 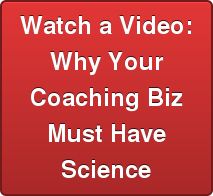 How do you access your online coach training?